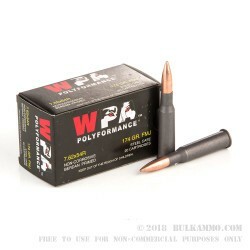 This 7.62×54mmR cartridge from WOLF Performance Ammunition’s Polyformance line of ammunition sports a 174 grain projectile, which is about 20 percent lighter than the bullet weight originally offered by the caliber when it was first introduced over 120 years ago. 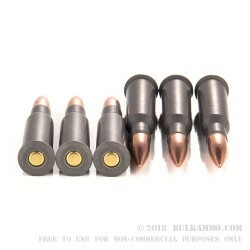 The bullet’s full metal jacket makes this round ideal for target practice, as it will prevent rapid lead fouling so you can enjoy more accurate shots between cleaning your bore. This cartridge is made in Russia, and appropriately features the country’s distinctive Berdan primed steel casing. It is non-reloadable, but steel’s lower price tag than that of brass is appealingly reflected in this cartridge’s price tag. The casing does sport a nice polymer coating to facilitate feeding and ejection as well. If you’re looking for an authentic experience out of your Mosin-Nagant rifle, you would be hard pressed to find one better than that offered by these hard-hitting and reliable rounds. A: Hello Miguel, The Wolf WPA ammunition is all new manufacture and does not use any corrosive components. Q: Is this ammo lead core or steel core? Is it also a copper jacket or bi metal? A: Hello! 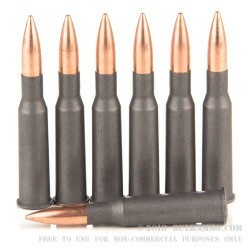 This ammunition features a lead core with a bi-metal jacket.